After experiencing the National Gallery and the British Museum, the Tate Modern was shocking in and of itself. 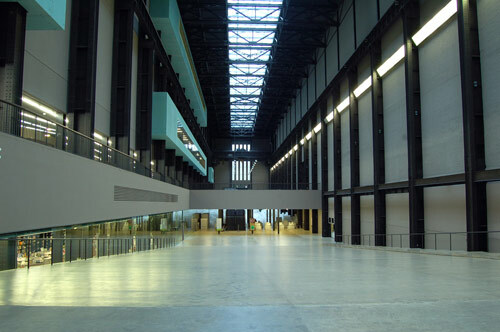 Compared to the beautiful architecture and classical feel of the other two galleries, the vast emptiness and cold steel of the Tate created an almost uncomfortable feeling. Meant to emphasize the artwork displayed, the white walls and dead space made us feel small. The Tate was also much louder and more family-friendly than the other two museums. Children were sprawled out on the floor and benches, creating their own modern art. Graphic installations were clearly marked by both signs and museum employees. We were impressed by the museum’s effort to be open to all audiences. Through a combination of choice and naivety, the three of us entered Paul McCarthy’s Projection Room. At first, we were simply disgusted and disturbed by the sexually explicit/grotesque imagery. The videos were so shocking that we can barely even remember what we saw. (For those brave at heart, just google image search “Paul McCarthy” for video examples similar in nature to the exhibit.) A brief peek at the Viennese Actionists exhibit didn’t help to settle our stomachs and minds, so we decided to leave. We’ll leave you with this and let you interpret for yourselves McCarthy’s art and vision. My first impression upon entering the National Gallery was skepticism that the art could possibly be any more beautiful than the building’s architecture. I’m not usually much of an art person (although I’m a HUGE Dalí fan), and I usually don’t spend much time in museums dedicated entirely to art. However, to my great surprise, I was abslutely fascinated by the thousands of paintings. Of course, I got to see paintings I thought I would only ever see in photos, such as Van Gogh’s Sunflowers and Monet’s Japanese Bridge. Additionally, I chose to make note of paintings I previously was unfamiliar with that caught my eye. Of these, my favorite was Louis-Léopold Boilly’s A Girl at a Window. The oil on canvas painting originally attracted me because it is painted to look like a framed still image; therefore, it is in black and white and rather unique. As I drew closer, I noticed the clarity of the details, especially those of the fish in the bowl next to the girl. The painting is so clear, it could easily be mistaken for a modern-day cartoon or CGI. Being a terrible artist myself, I never imagined a handcrafted painting could look so smooth and realistic. While looking at the medieval collection of the Gallery, I noticed various paintings depicting the Biblical scene of St. Michael the Archangel defeating the Devil. Carlo Crivelli’s St. Michael (1476), Bartolomé Bermejo’s St. Michael Triumphant Over the Devil (1468), and Piero della Francesca’s St. Michael (1469) all portray St. Michael similarly. He appears as a rather young looking boy wearing medieval style armory. However, Francesca opts to give the archangel wings instead of a cape. The most noticeable difference to me, though, is in the way the artists chose to represent the Devil. Crivelli’s Devil resembles a lizard-like demon, whereas Barmejo’s Devil is smaller and much more cartoonish and almost comical when compared to the triumphant St. Michael. Francesca’s is once again different from the other two, as he portrays the Devil as a simple serpent in the corner of the painting, which focuses on the archangel instead. These paintings fascinated me because of their diversity. I always knew styles of art changed over time, but I never really considered the diversity that could exist between the contemporary artists of a time period. Seeing these three paintings that show the same subject painted within a few years of one another helped me to appreciate the different ways in which artists might imagine their subjects. This afternoon, my group and I found our way to the Docklands Museum near Canary Wharf. We encountered some trouble en route when our DLR conductor announced the train would not be stopping at West India Quay. We got off at Westferry and a friendly gentleman on the platform pointed us in the right direction. As his directions weren’t entirely clear, we had to ask two other people where to go along the way. Astonishingly, we didn’t get lost and all 13 of us made it there with time to spare. The most engaging of the galleries was “London, Sugar & Slavery,” an exhibit about London’s role in the Atlantic Slave Trade. After taking “The Atlantic Slave Trade and Africans in the Making of the New World,” with Professor Ball last semester, I was especially interested in seeing how the museum’s perspective compared to those taught in the class. Surprisingly, the first sign that caught my attention was one toward the beginning of the gallery entitled: “Terminology.” This sign made visitors aware of how the museum intended to use specific words. For example, the museum emphasized that it would use “enslaved Africans” instead of “slave,” as “slave” is a more dehumanizing words. The sign also defined vocabulary words the average visitor might be unfamiliar with. I’ve never seen anything similar to this in American museums. Terminology is an important process in the exhibition development process, as I learned this summer during my internship at the 9/11 museum in Manhattan. Especially for sensitive topics, it is important that the terminology be deliberate and exact. I was impressed that the museum chose to tell its visitors right up front precisely how words would be used in attempt to avoid any misunderstanding or misinterpretation. This reminds me of many scholarly articles I’ve read where historians choose to clarify vocabulary for the reader before jumping into denser material and analysis. The only part of the Slavery gallery that I noticed disagreed with what I had previously learned was a sign describing the “Triangle Trade” model for explaining how the Atlantic Slave Trade Operated, which involves ships leaving from Europe, picking up slaves in Africa, then sailing to the Americas, selling off their slaves, and returning to Europe h sugar and rum. Due to numerous circumstances, the slave trade was not so simple. Just for one example: slaves ships were specifically designed to carry human cargo; therefore, it would be impractical to use the same ships to transport both slaves and rum on the same vessel. However, I do understand why the museum would choose to use this model (as do most middle and high schools in the U.S. It is basic and easy to understand. The model gives a general idea of what happened, but avoids some of the grittier details. Finally (whew! ), I found the collection of comment cards about the Slavery gallery to be rather interesting. There was a shockingly wide range of reactions. Some people loved it and others absolutely HATED it. There were some comments that other guests chose to respond to. Many of the negative comments read along the lines of: “The slave trade isn’t my fault, so why should I care?”; “This isn’t London. What about all of the white workers who lived in terrible conditions?”; and “This is crap. I’m never coming to this museum ever again.” Some of the more positive responses included those commenting on the importance of treating all human beings as equals and working to fight the injustices that exist today. One particular comment that sticks in my mind was left by a person who felt the exhibit didn’t successfully address the sheer brutality of the slave trade. This, too, reminded me of some of the issues faced at the 9/11 museum. As 9/11 is such a recent and traumatic event, the museum often has to make decisions about what information is historically necessary and what is simply gruesome and voyeuristic. Finding a balance of between representative and appropriate is a daunting task. Although it has only been two days, we were beginning to become a little skeptical of A.N. Wilson’s portrayal of a London overrun by American corporations and solely meant for tourism. All of the places that were not already tourist attractions were certainly un-American, and the cuisine was not only worldly but also a surprising amount of fusion food available (Indian/Japanese anyone?). However, after visiting the Covent Garden Market, we caught a glimpse of the England that was made for the tourist. The market is best described as a market for those who want to buy foreign things, but not too foreign. In the Jubilee Market, the shops almost entirely consisted of souvenir and novelty stalls. People visiting were welcomed to buy everything from London t-shirts, to calendars of David Beckham, and even London-themed condoms (“Want to see Big Ben?”). For those who didn’t have the local currency, there were numerous exchange agents and even stores that accepted American dollars and Euros. The Apple Market was located in a 12th century abbey where the local monks would grow and sell their vegetables. Keeping in the tradition, there were a variety of chain stores, t-shirt vendors and cafes (The one fruit stand was not even located in the market, but outside one of the entrances). Of the two markets, Apple seemed to consist more of permanent establishments, however Apple Market’s aim was no different from Jubilee in its desire to attract foreigners, with a welcome sign in several different languages, albeit slightly higher quality. The surrounding neighborhood also played towards the same theme of tourism, with only the most popular chain retailers lining the streets such as Gap, The Disney Store, Starbucks, H&M, and others. The local theaters were mostly playing shows that had previously or were still on Broadway. Across from the market was the St. Paul’s Church but it was unfortunately closed at the time we were there. Slightly disillusioned by the cookie-cutter appeal of the Covent Garden area, we decided to walk back to the hotel. It took fifteen minutes of walking until the number of major chain retailers began to decrease and we began to see independent businesses (and pubs!). The market clearly recognized that this was the type of London that tourists both expected and wanted to see. The shops were easily recognizable, the streets were clean, the vendor made sure that you knew that what you were buying was foreign, and everyone was white. 1. In the exhibit about time in society where they displayed the evolution of clocks and wristwatches, I noticed that they included a cell phone. I thought this was great social commentary that might not occur to someone right away because recently many people have stopped using wristwatches even and rely only on cellphones for the time (especially younger people, myself included). 2. I appreciated how the museum displayed the comment cards that asked people to share their experiences of “When stopped for me…” I thought this added a more philosophical tone to the exhibit and made the point that the way people notice, remember, and live time in different ways. After lunch, Alli, Mara, Kim, and I ventured into the Greenwich Market and explored the variety of shops and vendors. We all got henna tattoos and I had a short, but nice conversation with the artist about the significance of henna in South Asian culture. Henna is used to stain the skin in intricate and beautiful designs and it is very popoular for woman to get hennaed for special occassions, especially weddings. In the artist’s words: “An Asian bride is not complete without henna.” She explained to me that hennaing is meant to be a very calming process; therefore, the bride, her sisters, and cousins will have hennaing parties before the event in order to calm the bride’s nerves. We then ventured beneath the Thames and wandered into the neighborhood on the opposite side of the river. We found Millard Park and stumbled onto a farm just beyond it. There were horses, sheep, goats, chickens, llamas, and one pig. At this point, one of my favorite things about London is the fact that many of the attractions are free to the public. It seems that the city tries to keep culture and recreation much more accessible than do many American cities (or at least the ones I’ve visited). We journeyed home on the Docklands Light Rail. It was nice to travel above ground on the train. It was faster than the bus would have been, but we also were able to see a bunch of different neighborhoods that seemed to vary in class. Our day started at the Goodge Street tube stop (no, that is not a bodily orafice). We took the northern line south three stops to Charing Cross, and jumped lines to the Bakerloo for four stops, and we had arrived at Elephant and Castle in the borough of Southwark. We had been warned that it was a questionable area. The reality was far more shocking. Immediately upon exiting the tube, we were approached by a man with a bloody face (no, not that kind of bloody, but a gruesomely literal BLOODY face) asking repeatedly for help. After evading what seemed like a potential mugging (considering that the “victim” didn’t ask the nearby policeman for help) we set off through Elephant and Castle. A walk through the painfully modern local University ensued. Being a college area there were many take-out and ethnic restaurants. In fact, the area seemed to be predominately lower class, dominated by Afro-Caribbean immigrants. Their culture was further depicted by the murals painted in the subway tunnels (which are walking tunnels, not tubes). We continued our walk into nearby Lambeth, where we found a large obelisk dedicated to King George. Though hesitant to approach and take pictures of the monument as there were several tramps hanging about, we eventually overcame our apprehension. On nearing the structure we were immediately greeted by the bare bum of a homeless man, having just unloaded on said monument. Luckily, he didn’t make it into any of our pictures, though the memory will be burned into our traumatized memories forever. Considering its location in a diverse community it is especially prominent. The message conveyed by the garden gives hope to the minorities who experience discrimination, not just in London, but throughout the world. Leaving the gorgeous garden and its Ice Age Tree Path (we’re not sure either), we entered the Imperial War Museum. Located in the building that once housed Bethlem Hospital, it is now a wide open space filled with various instruments of destruction. We chose to explore the morbid and depressing Holocaust Exhibit, which was appropriately desplayed in an age restricted corridor. Though tastefully done it left us feeling rather sad. We left. Returning to the tube station in an attempt to figure out why the stop got its name, we asked a security person whose response was “That’s just its name”. The only clue was a pub located next to the station called The Elephant and Castle. The area was, in fact, named FOR said pub, but admittedly we didn’t know this at the time. We did however make up a highly amusing story to explain the name that we had only ever heard of in Harry Potter. Ask us about it later. Our return was made on the number 68 bus to Russell Square, and we continued on foot to our hotel, where we collapsed in heaps of exhaustion on our beds and had to be pried off our beds with a shoe horn in time for discussion. Unfortunately, our designated camera had forgotten its memory card reader in its laptop case, so our pictures are currently marooned on said camera. They’ll come up sometime on Monday or Tuesday.